Our range of Designer Jewellery is offered in various gorgeous designs and unique colors. These are perfectly designed and are widely known for its fine finish and attractive designs. The products offered by our organization is a accurate combination of modern and traditional styles, which adds to the beauty of the women. 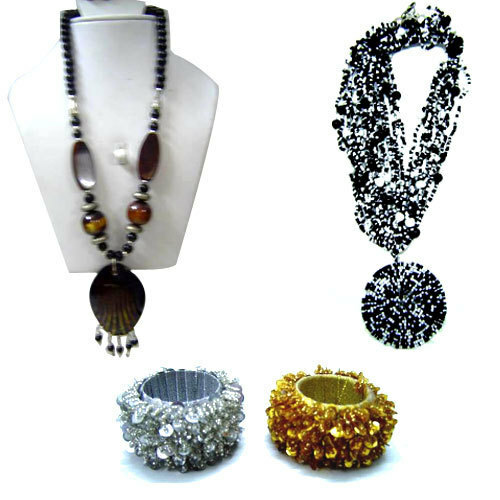 These sets provided by our industry are made of beaded jewelry comprising fabulous necklace and matching earrings. Established in 1994, we Ess Ess Overseas is one of the pioneered manufacturers, importers, exporters and suppliers engaged in providing a wide range of Designer Jewellery and Bags. Our wide range of product includes Leather Bag, Fabric Bags and Jute Bags. These products are widely applauded among our clients for its long-lasting nature and attractive colors and designs which are manufactured as per the international norms and standards. Our commitment towards our clients in providing qualitative range of products has been helpful in creating our reputation all across the globe. With the help of latest machines and equipments, we have been capable in providing a qualitative range of products which are provided at affordable prices maintaining the international standards. Each of our products undergoes various stringent quality tests conducted by our team of professionals who are highly knowledgeable and skilled as per their respective domain. Our organization is highly equipped with advanced machines and equipments which has been helpful in creating our niche in the market. Being a client-centric organization, we are highly focused towards the satisfaction of our clients by providing them the qualitative range of products which are flawless and provided to our clients without any compromises with the quality. We export our products in France, UK, Australia, New Zealand, Germany and also import from Taiwan.